MOR Music, York, Guitars and much, much MOR. So, where do you go if you have a moderate amount of music and you want to increase that quantity to an above average figure? MOR Music seem to be constantly pushing to evolve since moving into their new Fossgate premises a couple of years back. 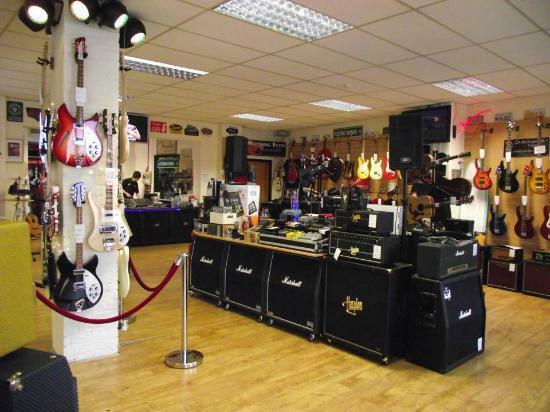 They have expanded into stocking a good range of drums and accessories, music tuition, instrument repairs and even coffee as well as the excellent range of guitars and accoutrements that they offer as standard. That said, as with so many inner city music stores, MOR Music is really a haven for the guitar player. The selection available is constantly changing and there always seems to be something of interest in stock. They have a vast range of Tanglewood acoustic guitars and electrics from the likes of Fender, Vintage, PRS, Squire and Encore. Add to this the carefully acquired range of used instruments and you’ll be covered whether you’re after your 1st or 20th guitar. Always a great range of stock at MOR Music! I have long since been a fan of the friendly staff at MOR, they are an attentive bunch who strive to help whenever possible but don’t unduly hassle their visitors. Whether you fancy a strum on a 6-string or just a chat about cymbals and cables, they’re only too happy to oblige and advise! I think MOR music is one of the most friendly and pleasant music shops, not only in York but that I have ever visited. They always seem to go the extra mile, whether you’re looking to buy a new instrument or have an old one repaired. All current stock is available to view on the MOR Music website but better still, why not pop in and get hands-on with what they have to offer! Say that I sent you and maybe I’ll get a discount off that Custom Shop Les Paul…..